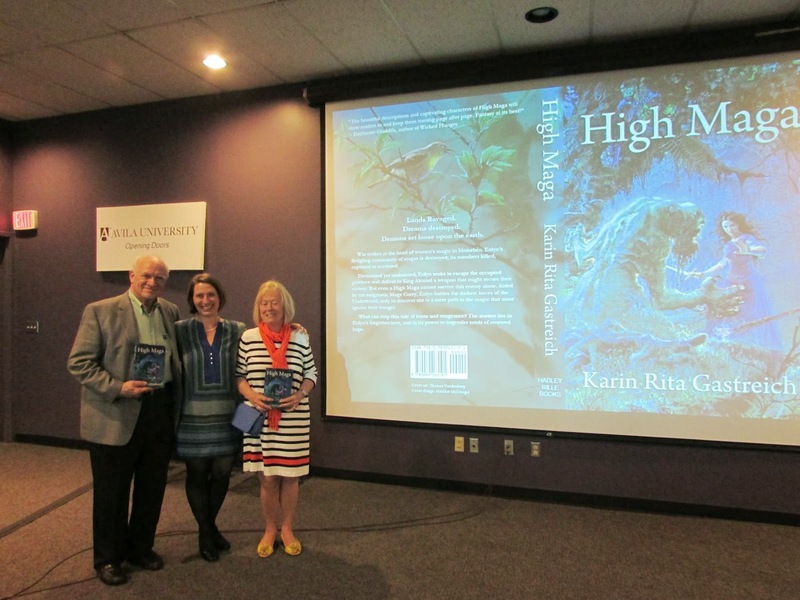 Launch party at Avila University. I am very grateful for the outpouring of support and positive energy that has come with the release of High Maga. It’s been a wonderful ten days, both on line and in the ‘real world’. The excitement of readers, friends, family, and colleagues has been contagious; welcome medicine after what was a fairly stressful two months in bringing the book to press. 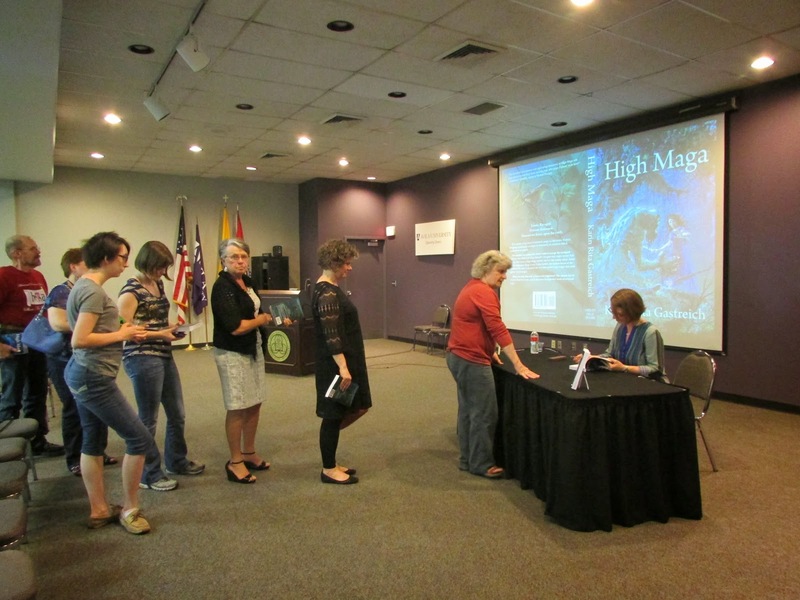 Two positive and very thoughtful reviews of High Maga have been posted on line, one by DelSheree Gladden at The Edible Bookshelf and the other by David Hunter at Heroines of Fantasy. 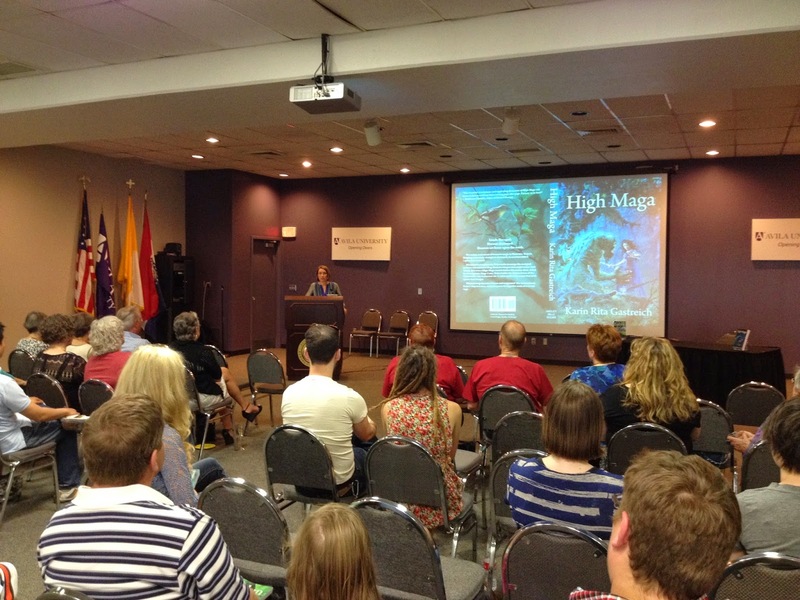 We had a great turnout for the launch party at Avila University. Hadley Rille Books editor Eric T. Reynolds was able to join us, his first foray into the outside world since a stroke took him out of commission about two months ago. I spoke a little about the inspiration behind the novel, and read several excerpts. And of course, I signed a lot of books. Unfortunately, in the excitement I forgot to record my readings, so I can’t post them here. But I’ll make up for that with some audio recordings in the coming weeks. On Tuesday, April 15, I’m starting a blog tour with Orangeberry Book Tours. There will be book features, author interviews, excerpts and more. To see the full schedule, visit my Orangeberry Book Tour page. This will be a short week at Avila. The university is closed on Holy Thursday and Good Friday, one of the perks of working at a Catholic institution. My husband and I will take advantage of the spring weather by heading to the Ozarks, where we hope to indulge in some well-deserved rest and recreation. When I return, I will have a very special surprise for fans and friends of Eolyn. Until then, enjoy Eolyn’s new adventure! With Mom and Dad after the show. Oh yes, you know what it is!